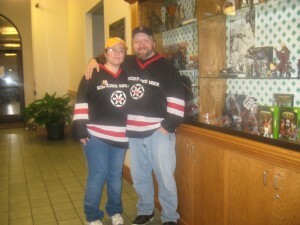 This weekend my wife Nicki and I had some errands to run around town. The tires on her truck have become balder than I am, I needed to get what little hair I have left cut, shop for some new shoes, and grab a bite to eat. 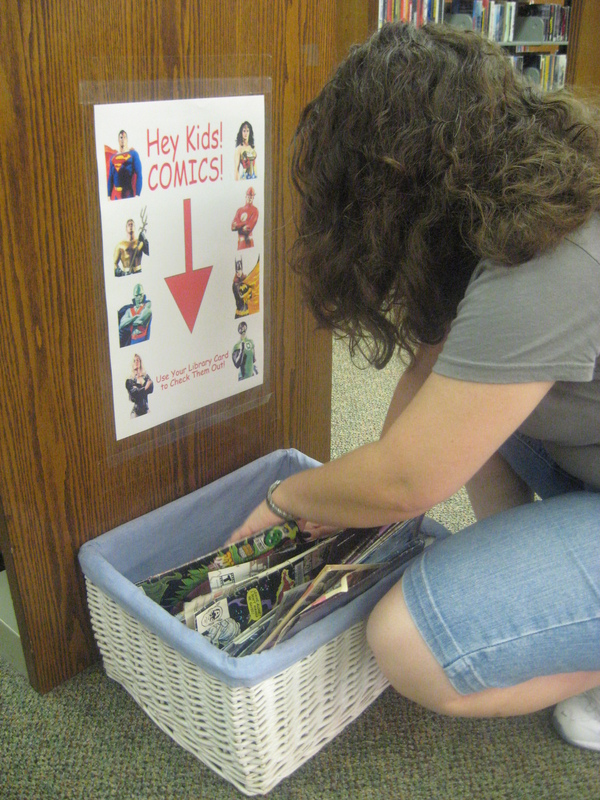 She had been going through her comics collection earlier in the week and decided to weed out some of the comics she didn’t want anymore. 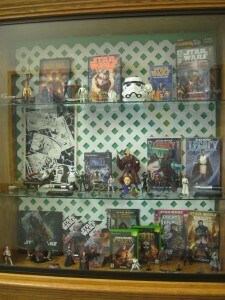 Most were fairly recent so most comic shops weren’t going to be interested in them. 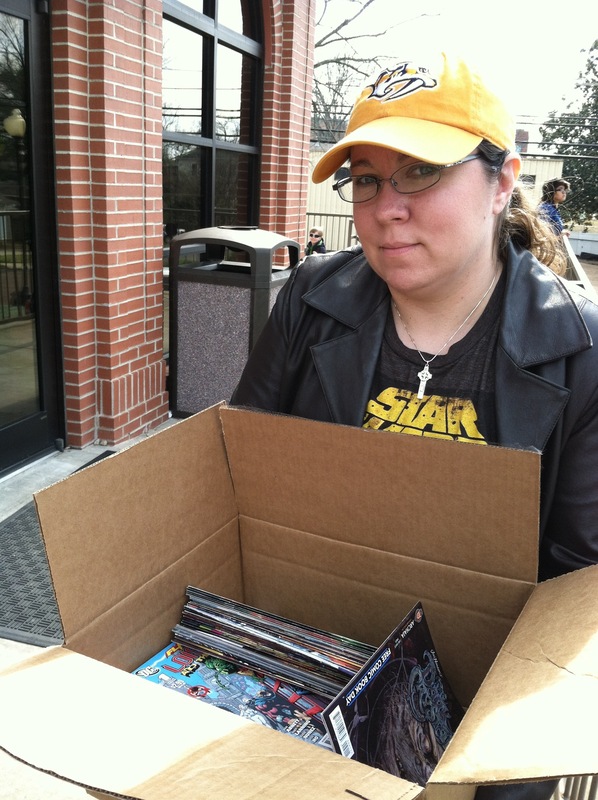 After letting me pick out which Batman and Harley Quinn books I wanted we packed up the rest and dropped them by our local library. 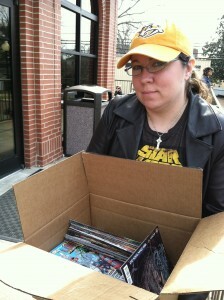 The head librarian Heather Lawson was happy to see us walk in with a box containing 111 comic books! 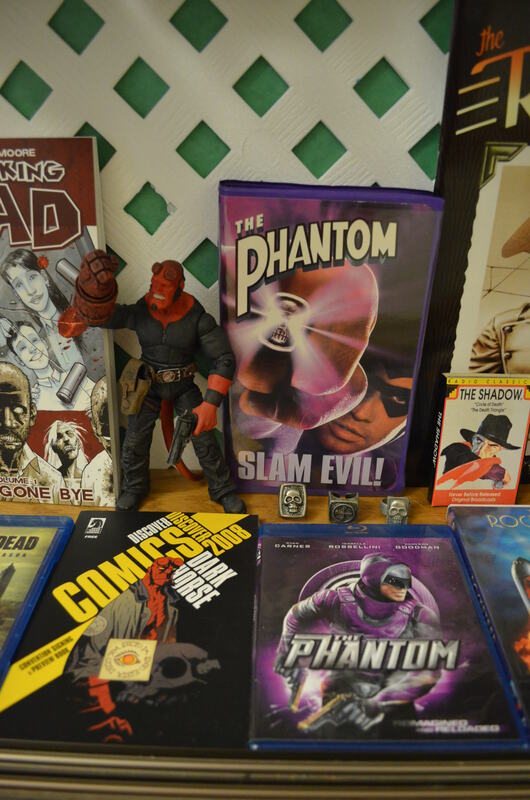 Most were Marvel and DC superhero comics, but there were also some Free Comic Book Day samplers and other very kid friendly books, too. 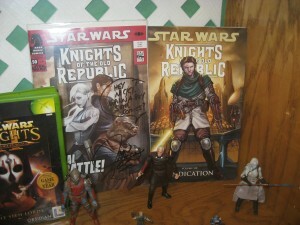 She thanked us for our donation, and gave us a tax deduction form! 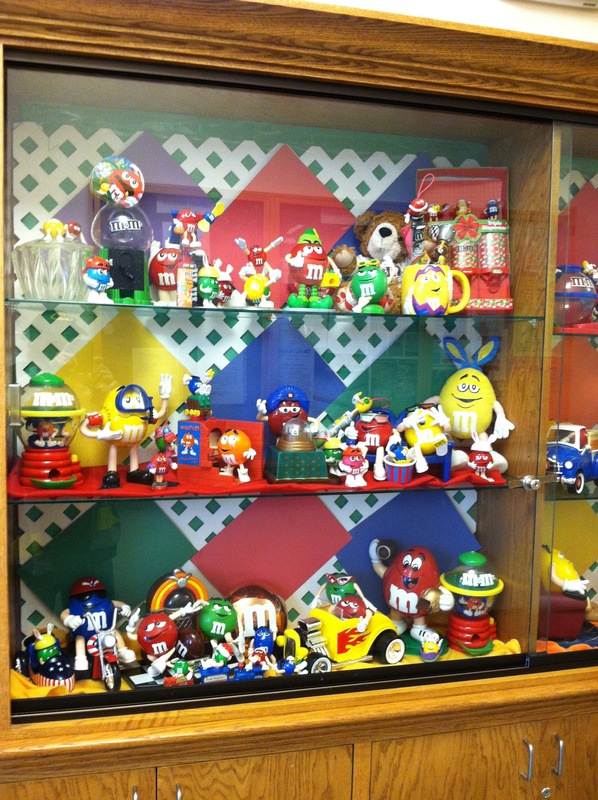 While we were there we noticed there was a new collection on display in the west entrance- M&Ms! 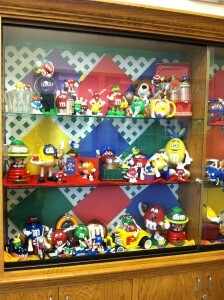 It was very cool and colorful. 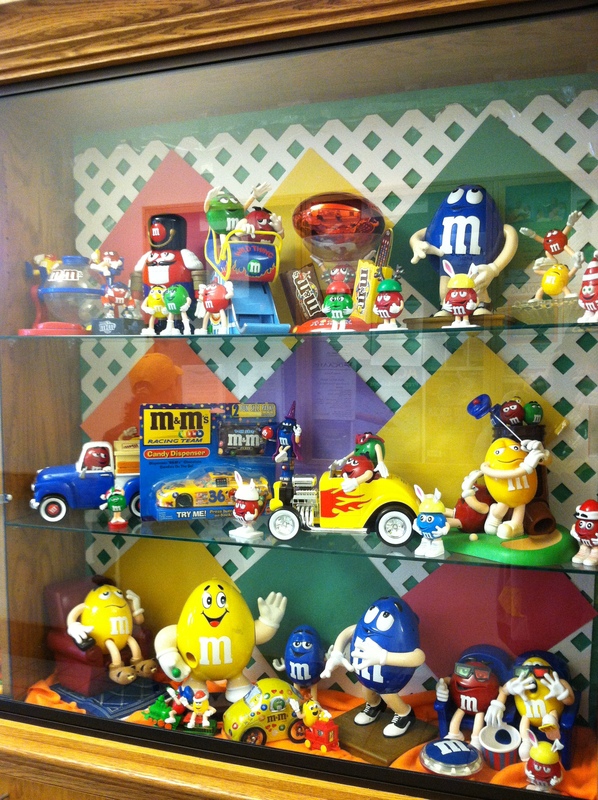 The large display cases on the left and smaller one on the right were all filled with M&Ms collectibles of all sizes and colors. 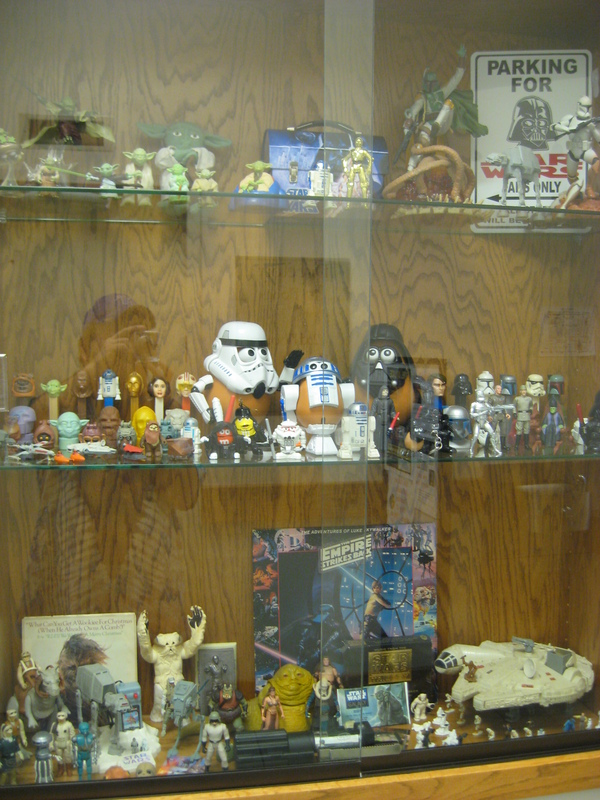 The library encourages local collectors to share their varied collections with the local community. 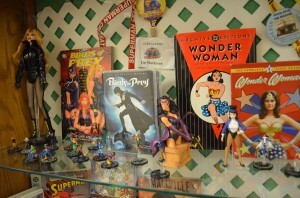 We’ve seen paper craft displays, Wonder Woman, and some other great ones. 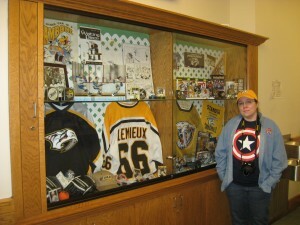 Nicki and I have had some of our shared collections on display at the library in the past. 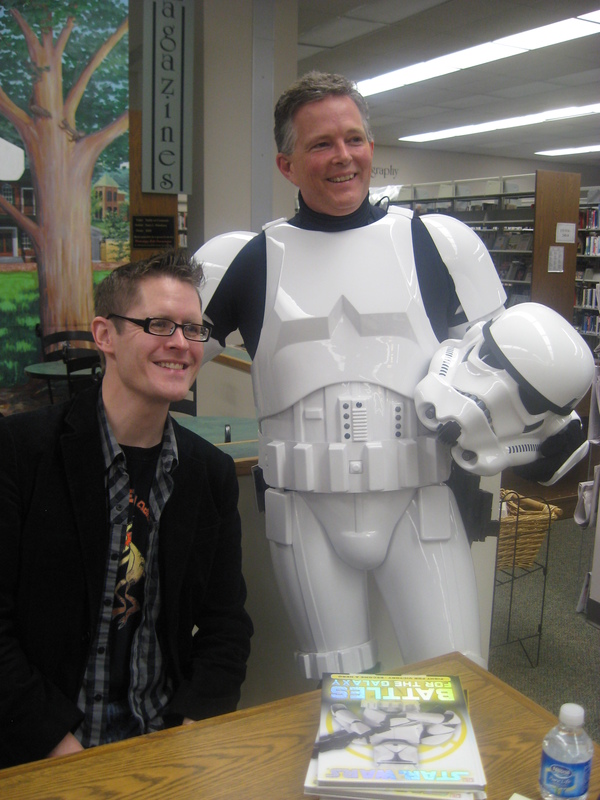 Our first was a Star Wars one to coincide with author Daniel Wallace‘s appearance at the library. 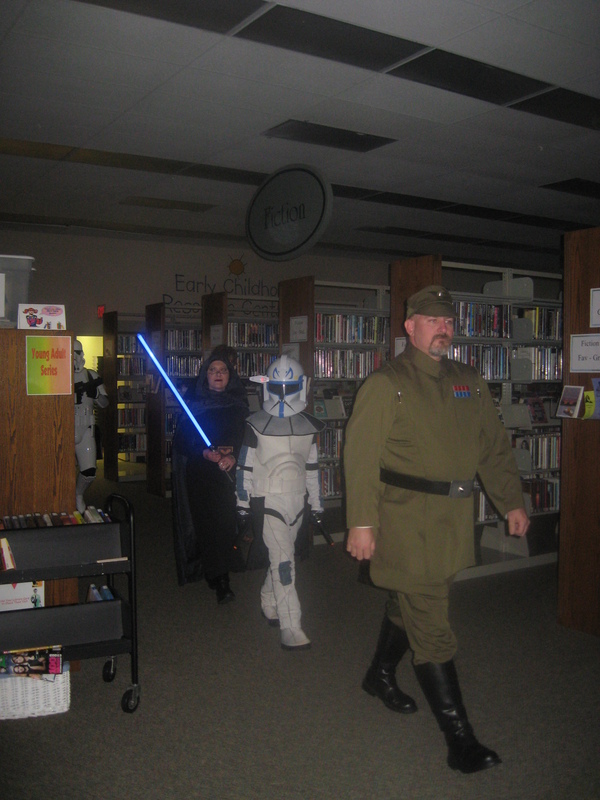 There was a great turnout by Star Wars fans of all ages. 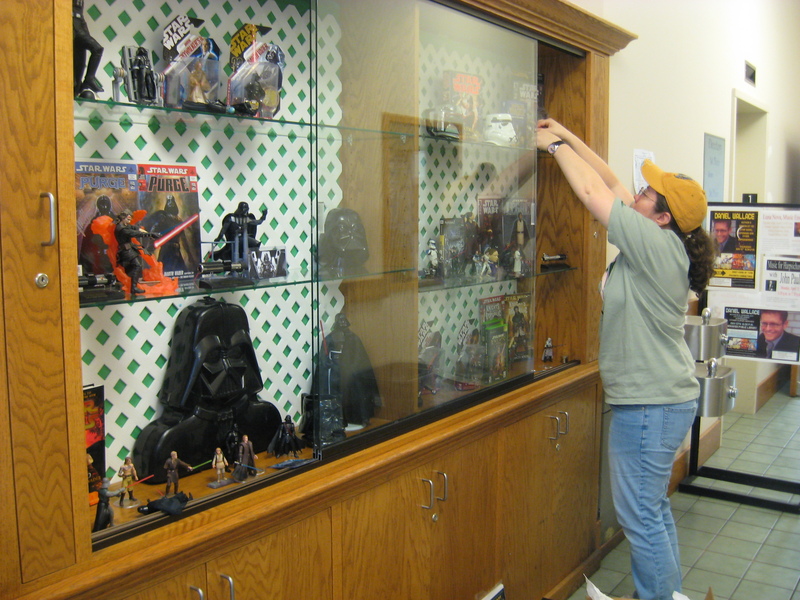 Nicki and I have both been Star Wars fans since we were kids, and have fond memories of seeing the movies on the big screen. 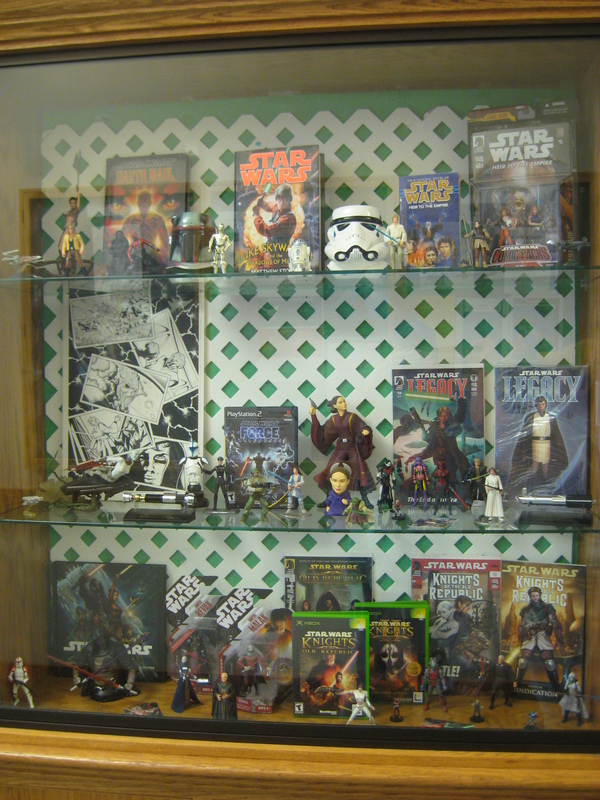 Over the years we’ve collected Star Wars comics, comic art, video games, novels, statues, action figures, and- oh, yeah…the movies! 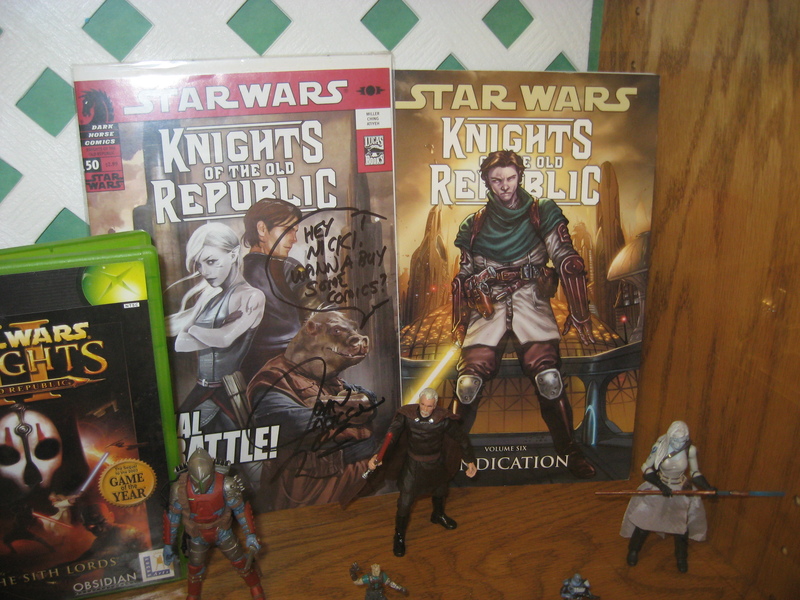 Above are some of Nicki’s favorite comics- “Star Wars: Knights of the Old Republic” written by our friend and former Memphian John Jackson Miller. We also put a couple Darth Vader sketch cards I did for Nicki in the display- the wide one is from the Topps‘ The Empire Strikes Back widevision set. 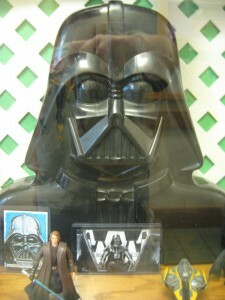 I’ve worked on four Star Wars sketch card sets for Topps, and contributed some to the 501st‘s 2012 Star Wars Celebration set. 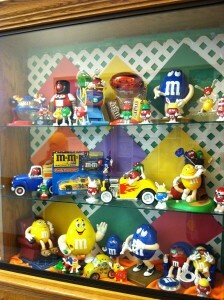 In the small display case we put some of my PEZ dispensers, candy heads, mini playsets, action figures, records, and Nicki’s Mr. Potato Heads. Many of the items we’ve both had since we were kids. 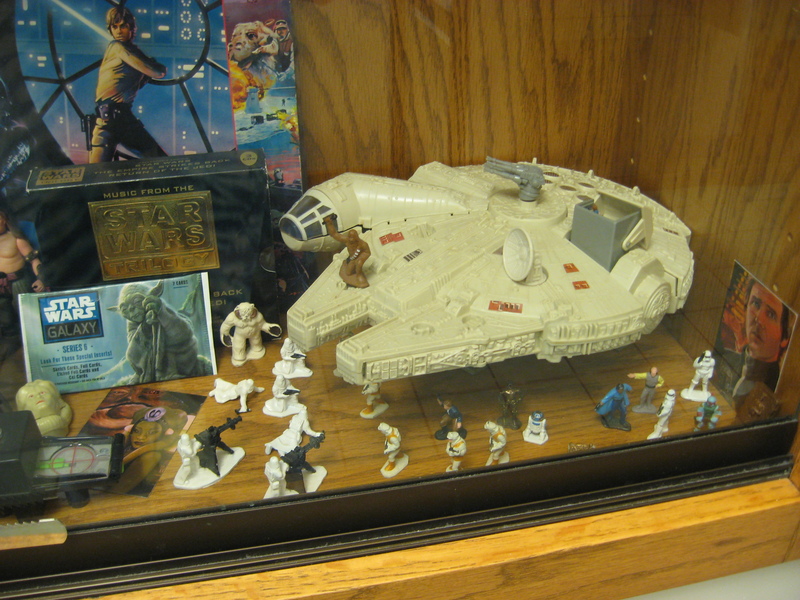 We both spent a lot of hours playing with them recreating our favorite scenes from the movies or making up our own Star Wars adventures. 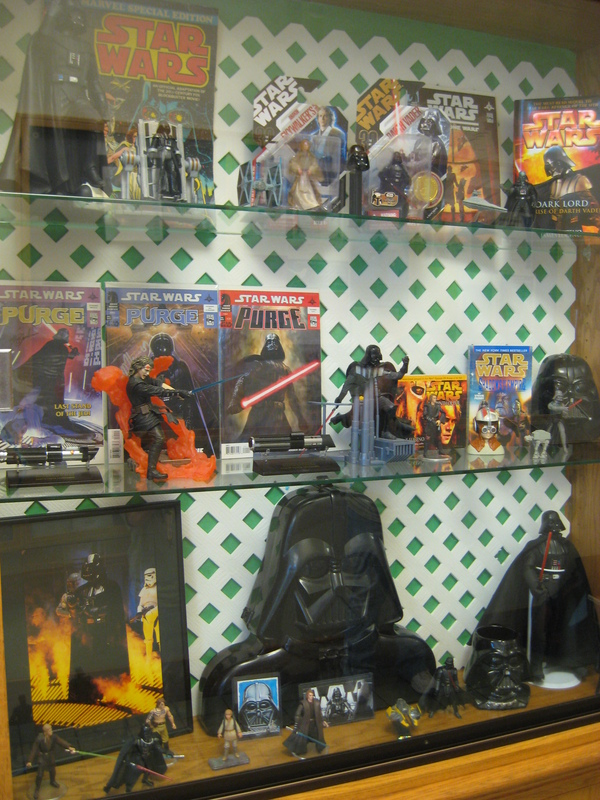 Hey- it took years before we could watch any of the Star Wars movies at home on TV, and even longer for the prequels to arrive! 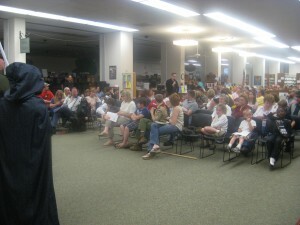 Daniel’s book signing event at the library was a lot of fun. He was escorted out by members of the local 501st garrison and Memphis Fan Force– including our friends Traci Brown (Jedi Barris Ofee) and Kevin Avent (TK 2651). We had a lot of fun setting that first display up and folks got to enjoy it for a month- but it was difficult trying to figure out what to bring and what not to! Same thing happened with our second one. It was made up of some of our NHL hockey collectibles including Predators and Penguins jerseys, action figures, pucks, license plates, rally towels, photos, trading cards, car flags, and more. We even had some comic art from “The Waiting Place” by Mike Norton, and some Hanson Brothers (from the movie Slap Shot) collectibles on display. Steve Carlson/Steve Hanson was the first head coach for the Memphis Riverkings (now Mississippi Riverkings since their move across the state line into Southaven, MS a few years ago). 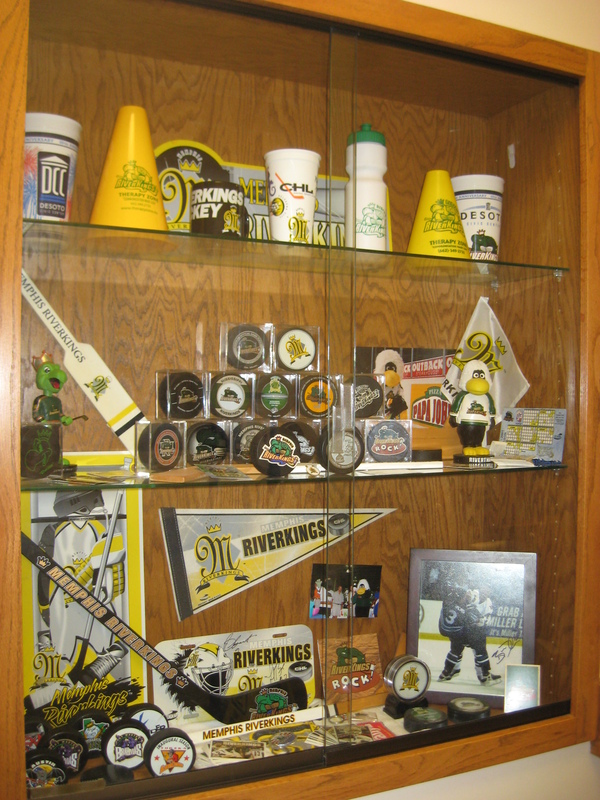 And speaking of our local Riverkings, we had plenty of their merch represented- Riverthing and Sheldon bobble-heads, team pucks, mini hockey sticks, pennants, noise makers, photos, trading cards, cups, keychains, pins and buttons were all on display in the smaller display case. 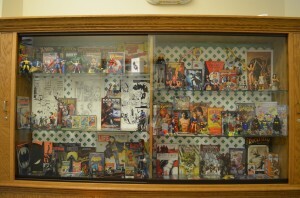 The next display we did was a comics one a few months later. This one got to be up for two months. 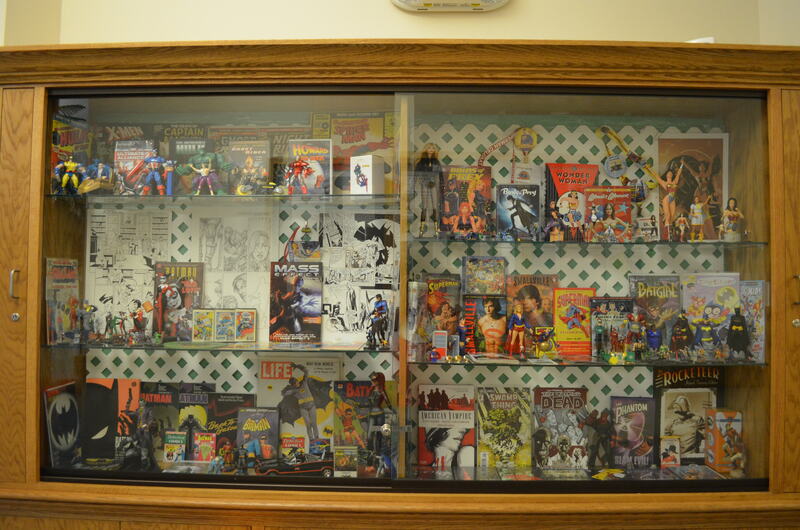 We picked a few of our favorite comic books, pages, movies, soundtracks, action figures, and statues and filled the big display case. 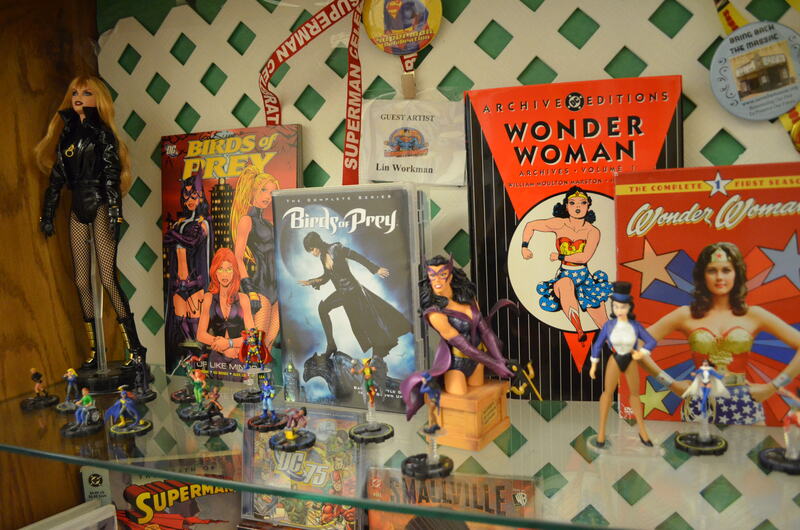 Nicki had some of her favorites represented- Birds of Prey, Batgirl, Nightwing, and Wonder Woman. We didn’t just have DC characters like Batman represented. 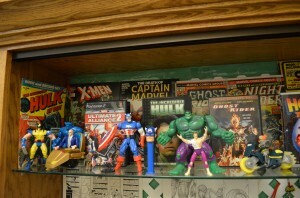 We had some Marvel superheros join us, too. 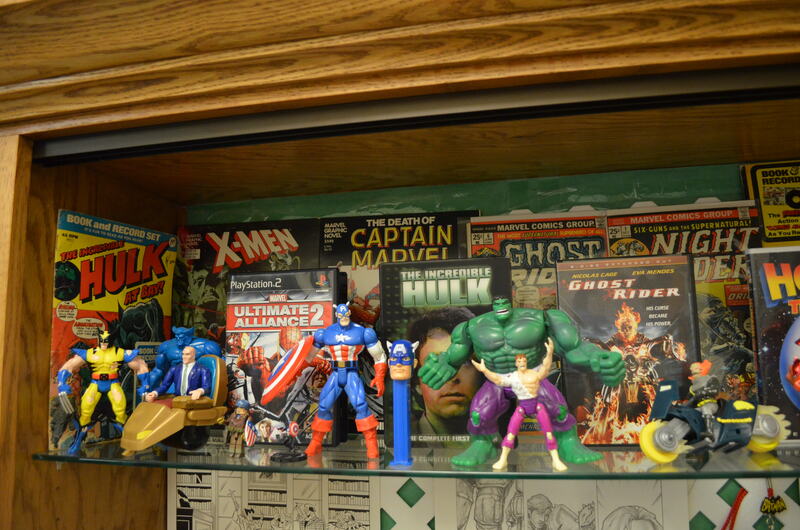 I was a big Spidey and Hulk fan growing up, and Nicki loves her some Captain America and Bucky. 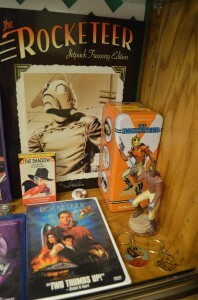 And who doesn’t love Howard the Duck..? We also had some of my other favorites- The Walking Dead, Hellboy, The Phantom, The Shadow, and The Rocketeer! We stocked the smaller case with books that are collections of comics, biographies of comic creators, books on making comics, “Reading With Pictures“, and a CD by the band Kirby Krackle which contains songs about comics. 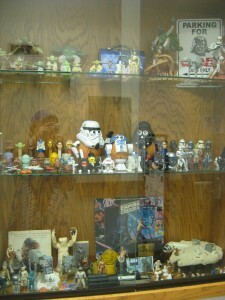 Also had a few of my comic con badges on the bottom and related action figures throughout the case. We love the fact that our library supports comics, and encourages people to learn how to make comics of all kinds! 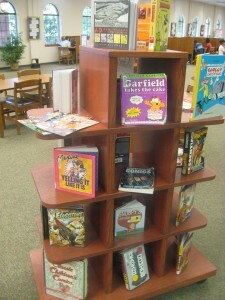 I hope your library does, too. 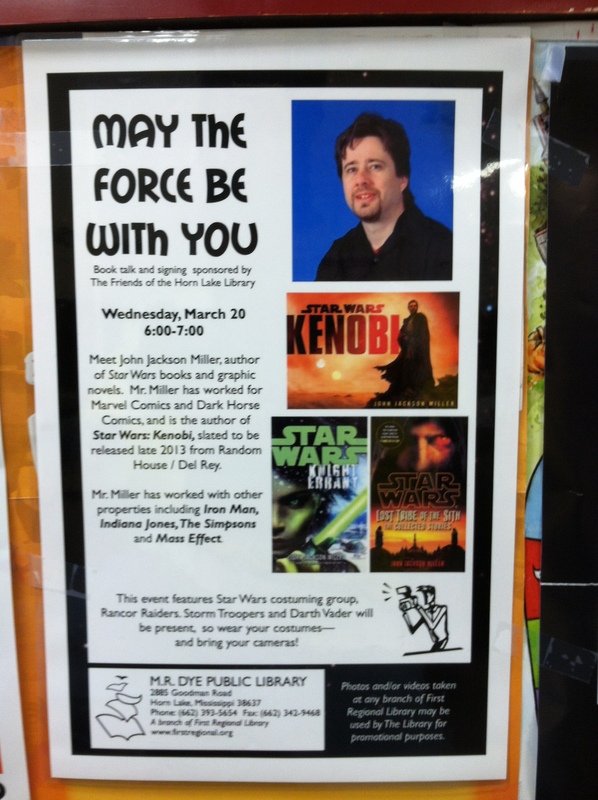 Oh, BTW- John Jackson Miller will be at the Horn Lake library on Goodman Rd (just south of Memphis and north of Hernando) on Wednesday March 20 6-7pm. 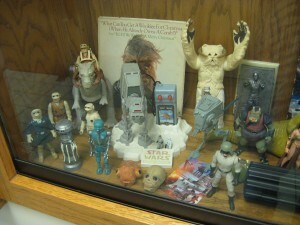 He will be in town that weekend for Midsouthcon at the Memphis Hilton, along with fellow Star Wars author Christie Golden. 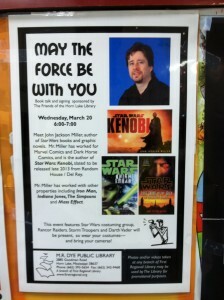 May the force- and a good library, be with you! This article was very helpful. 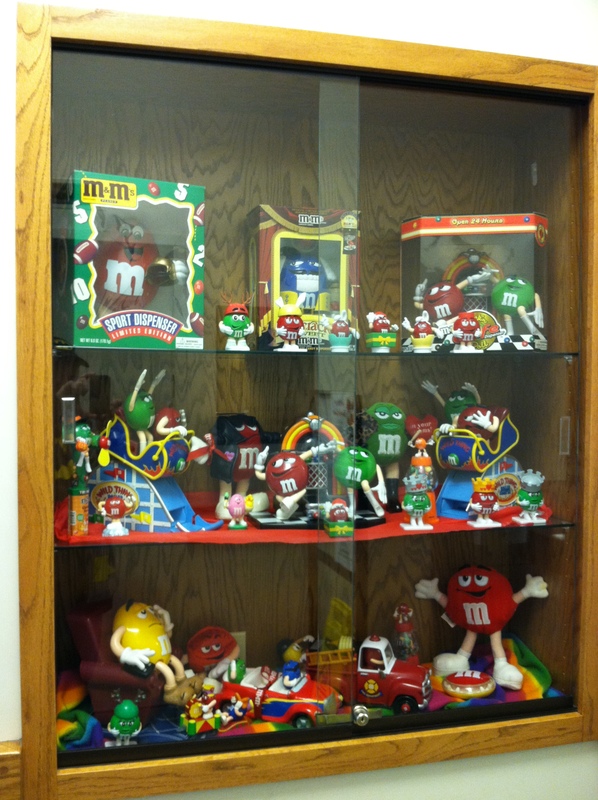 I work for a library system, and I am currently in charge of my branch’s glass display case. 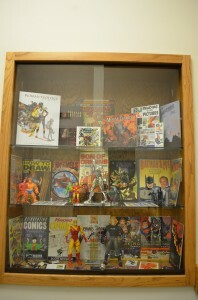 I was thinking of doing a comic strip and comic book display in the near future. 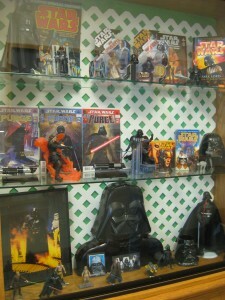 Your pictures from this display were very helpful. It gave me more ideas on how to arrange my future display. Thank you! Thanks. We’ve got an awesome library and librarians. 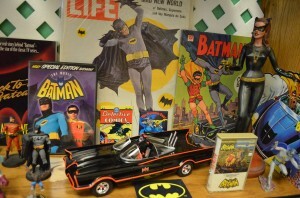 Recently did a ’60s TV Batman one there to celebrate the show’s 50th anniversary.